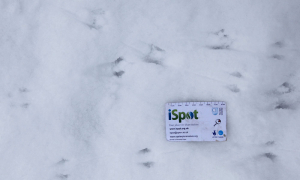 Observation - footprint in snow5 - UK and Ireland. Description: Is it possible to ID these tracks, presumably made by mice or voles? Snow soft and powdery so can't see the pads. Is it possible to ID these tracks, presumably made by mice or voles? Snow soft and powdery so can't see the pads.